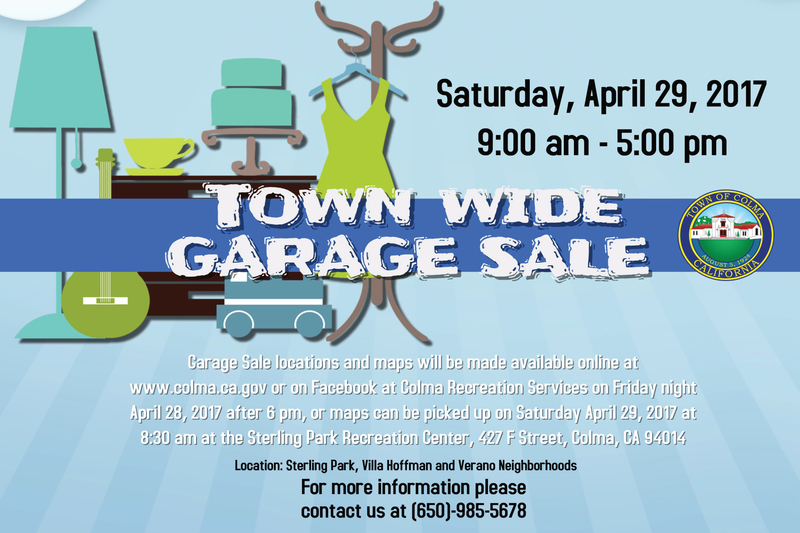 Add to calendar 2017-04-29 09:00:00 2017-04-29 17:00:00 America/Los_Angeles Town Wide Garage Sale Come find great bargains and deals at the Town of Colma's Town wide Garage Sale. In years past there has been over 30 different households participate, and we are expecting the same again this year. On Friday night April 28th at 6:00pm we will provide a list of Garage Sale locations and some of the participants big ticket sale items on the Town's website in the Newsroom. For more information please contact us at (650) 985-5678. Come find great bargains and deals at the Town of Colma’s Town wide Garage Sale. In years past there has been over 30 different households participate, and we are expecting the same again this year. On Friday night April 28th at 6:00pm we will provide a list of Garage Sale locations and some of the participants big ticket sale items on the Town’s website in the Newsroom. For more information please contact us at (650) 985-5678.